September 11, 1945: An American officer with a gun stands over General Hideki Tojo (Japanese prime minister in 1941), just after he has shot himself. So says the unpublished Associated Press photo caption; and so says History, which has OTHER HIGHLY QUESTIONABLE STORIES too. David Irving talks privately in the Midlands and Scottish towns on WW2's Hidden History. An evening with the British historian. DAVID IRVING’S writing career started in 1960; he was discovered by British publishers, then by an American literary agent – and then by the traditional enemies of free speech; Jewish organisastions began their protracted and shameful campaign against him soon after. His first book, The Destruction of Dresden, unwittingly threatened the uniqueness of their Holocaust story. Irving had learned from surviving German officials that the three-hour British air raid, executed against the defenceless refugee-filled city of Dresden in the chaos just before the Second World war ended, had killed 135,000 people. The bodies were openly cremated in cordoned-off squares. “A Nazi lie,” shrieked the Jewish press. The Sunday Telegraph, which had just been founded, had a plucky editor, whose background was in Bletchley Park and codebreaking; he shared Irving’s passion for real history, and serialised Dresden for three weeks, which ensured it could not be silenced. 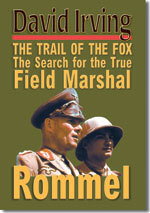 The book, and the others which Mr Irving researched, like that on The Destruction of Convoy PQ.17, the Hungarian Uprising, and original biographies of big names like Hitler, Himmler, Göring, Rommel, the Allied field commanders and Churchill, brought him fame and an increasing flow of royalties. The Jewish opposition tried in vain to silence him, secretly putting pressure on newspapers and blackmailing Irving’s own publishers to halt the book and smear him. Very early, in 1963, they staged a break-in in Mr Irving’s North London apartment but he caught all three Jewish burglars red-handed, called the police, and they ended up with criminal records. The enemies have failed despite everything: he still has a blameless record, unsullied by drugs or crime. From 1977 to the present day, everywhere that he spoke mobs of Jewish and Communist thugs turned up. The obedient German police set up an ambush in Munich in 1993, failed to catch Mr Irving, and banned him from Germany instead; the ban lasted twenty years. From 1992 he was successively banned from setting foot again in Australia, Canada, New Zealand. 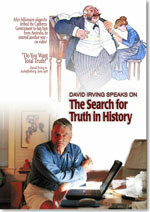 Mr Irving’s international campaign for Real History began. The Internet era took his enemies by surprise. In November 1994 he confronted Deborah Lipstadt, a minor American professor of religion, in person when she smeared him publicly in Atlanta, Georgia, and offered her $1,000 if she could produce the document she had just boasted about to her audience. Robert Maxwell secretly persuaded Lipstadt to include Irving’s name in her tedious book on “deniers” (a word she invented). The High Court in London was awash with Hollywood money. Hollywood billionaires like Steven Spielberg, people to whom money is everything, pumped $13 million dollars into that courtroom. Unsurprisingly the British Judge, trying his first action, found after a three-month hearing that yes, Lipstadt had indeed libelled Irving in five or six claims, but that somehow her “Holocaust denier” claim was true. How her friends crowed. To Mr Irving money is meaningless; they could, and did, take everything he had, including his Mayfair apartment of 38 years, leaving him homeless and even without his archives, illegally spirited away. That “denial” libel is still parrotted around now, although for ten years Mr Irving has conducted an annual tour to SS sites in Poland and Latvia, where the real Holocaust occurred (not at their phoney “Disneyland” site Auschwitz). Yes, how they crowed. That was their mistake: he resumed his campaign. Baffled, Lipstadt has actually complained that Mr Irving is back again, writing, speaking, and publishing books. They tried again. In 2005 the Austrian “system” government tricked him with an invitation to Vienna, arrested him on trumped-up charges brought sixteen years earlier by a Jewish body, and found ways of putting him in prison, in solitary confinement for over a year, after a courtroom hearing which had British newspapers erupting in fury at Austria, and leading names coming out in his defence. Mrs Angela Merkel established a German Government Commission of conformist historians, which dutifully agreed that the British had killed “only twelve thousand” that 1945 night in Dresden. 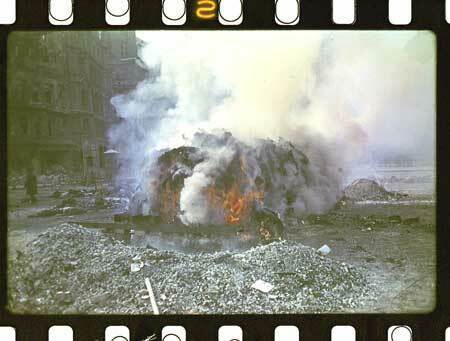 That was ten thousand less than died in the firestorm at Pforzheim, a week later. Mr Irving emerged from the prison ordeal unrepentant, triumphant. He fought back: He won a court decision that his missing archives be returned, all 400 boxes of them, and went back to work in the archives.. It was then that Irving, methodically working through recently released top-secret records, found undeniable proof that his claim about the Dresden death-toll, what his opponents called “Dresden lie,” was right. On March 24, 1945, six weeks after the brutal air raids, the police chief of Dresden had secretly reported to Berlin, in code, that the city’s mayor stated that as of that morning up to 100,000 people were still “missing” – uncounted and unaccounted for; unidentifiable heaps of ashes. So: they have been trumped. His enemies are losing the battle. They have found they cannot defeat Real History. It is a real, living, organism — constantly being updated. In a lifetime of writing, Mr Irving has come full circle, and the truth at last is glistening through the slime and lies. “I’m not finished,” he says. “Volume Three is still to come,” he said referring to his biography of Churchill, published since 1987, his most sensational volume yet. 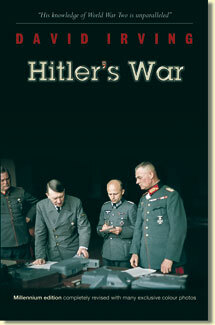 Volumes One and Two of Churchill’s War have already appeared.